I love a nice rustic feel to Christmas. It looks very country or cottage – like. That tablescape is simply perfect!! Very pretty! The lanterns add a classic touch. This would look great on my table! 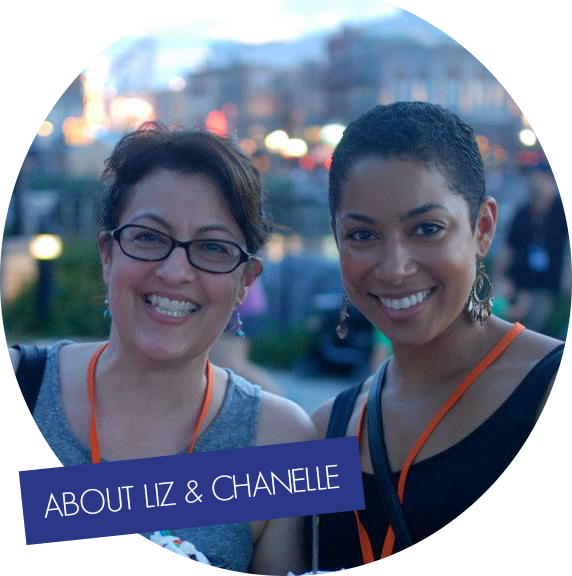 I love this love – especially the lanterns! I like that this decor is so down to earth. 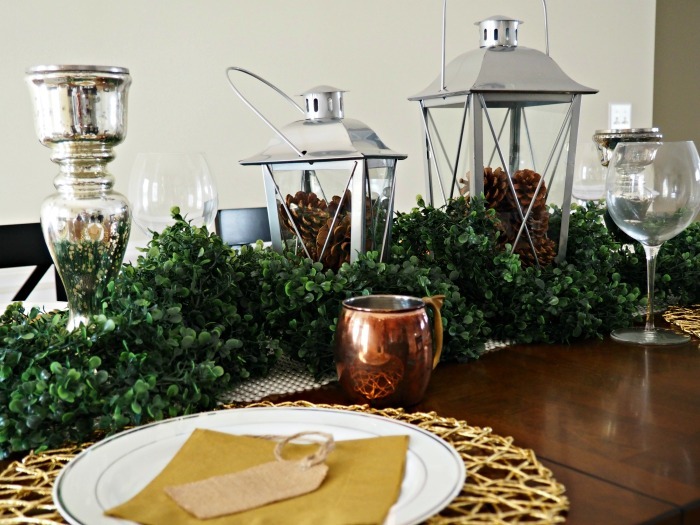 I love the silver, gold, and copper tones with your holiday decorating. You did a great job. 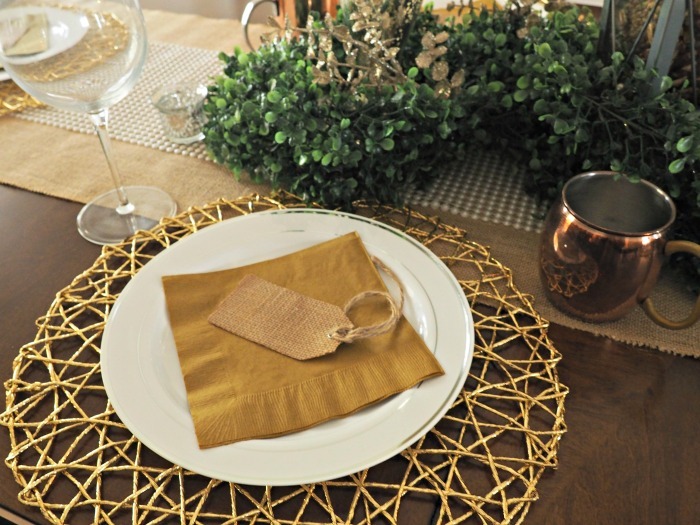 I like the gold placemats best. I really love this. It looks beautiful! I would be tempted to leave it out awhile. It’s been a long time since I placed an order with Oriental Trading and now I see what I’ve been missing. Everything here is beautiful and I will check out those lantersns. I love this gorgeous tablescape! 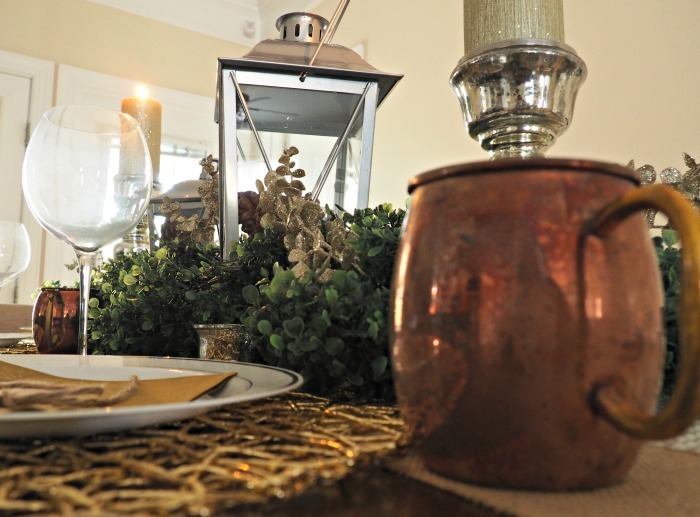 My decorating style can be described as rustic glam and I am swooning over those copper mugs! This looks like such an elegant tablescape. I love the addition of gold!! Looks so pretty and elegant. I love this rustic style. The lanterns really give it a special touch. It gives it an old-fashioned quality. 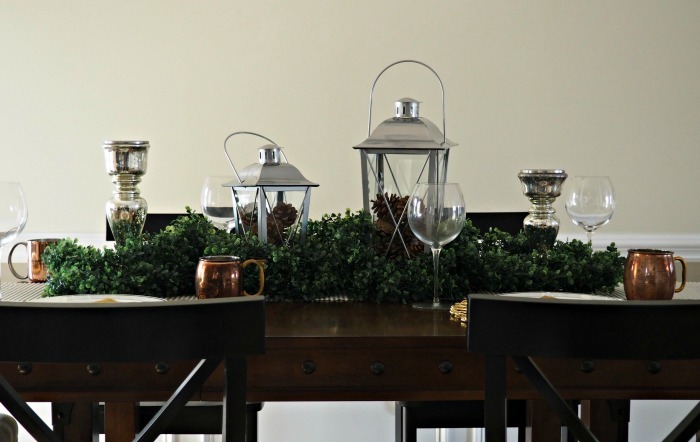 Your tablescape looks elegant, yet homey and inviting. Great job! 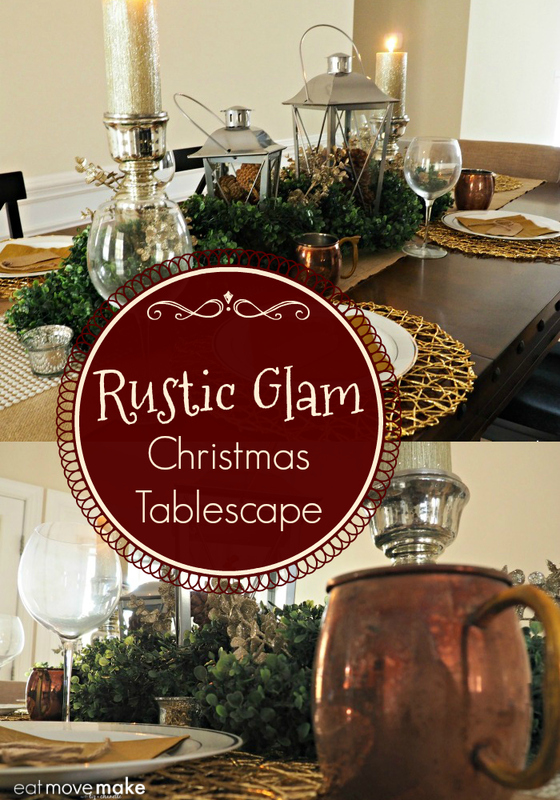 This really is a glam rustic look! I love how it all turned out. Your guests will be impressed! 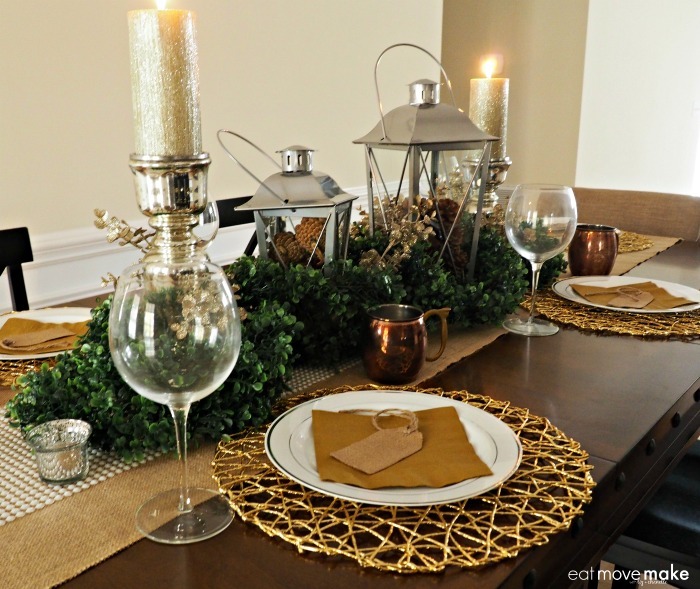 I love this table setting! It is so rustic and the lanterns look so pretty on the table. All the colors go together and are great! I want to copy your tablescape. This is so pretty! I have not taken any consideration about what I am doing this year but I love this. I had no idea that Oriental Trading had so many cool decor items. I thought they only sold crafts and party favors! You did a great job. I love Oriental Trading and I have only used them for VBS and kids party items. Creating a beautiful look like this with their products is something I could do as well. Thanks for sharing. I totally love this! I need a new idea for my table and going to use this! You knocked this one out of the park! It’s a gorgeous setup! It is a pleasant departure from what we are accustomed to during Christmas time. I love how you decorate the table. Looks so attractive. You are very creative and great. I love this rustic theme! The place mat and burlap runner really did add a great texture. I love how it turned out! I love how you incorporated the Moscow mule cups. I don’t drink Moscow mules but I think the cups are really pretty. I love it all. The placemat’s though are really fantastic. I REALLY want to get some for my tables. So cute. This is so pretty! I love the pinecones in the lanterns! And greenery on the table is my favorite. This tablescape is so beautiful. I love the rustic look. Rustic decor is my favorite. I love the idea of the burlap runner. Your table is gorgeous! Thanks Kelly! I had a lot of fun with it. This is exactly the kind of look I love. You can put on the dog without looking presumptuous and snooty. Great! That looks absolutely beautiful! I love this because it’s not overly fancy. I really don’t go for the ultra frou frou stuff.